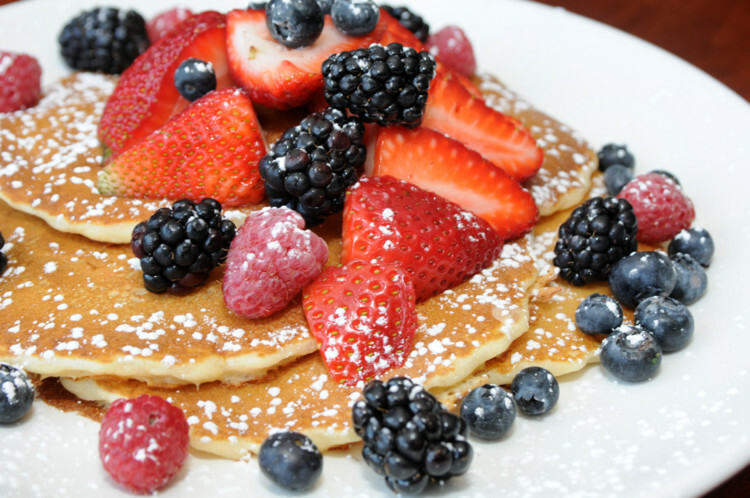 Photo courtesy of Wildberry Cafe Wildberry Cafe specializes in all types of kid-friendly pancakes. 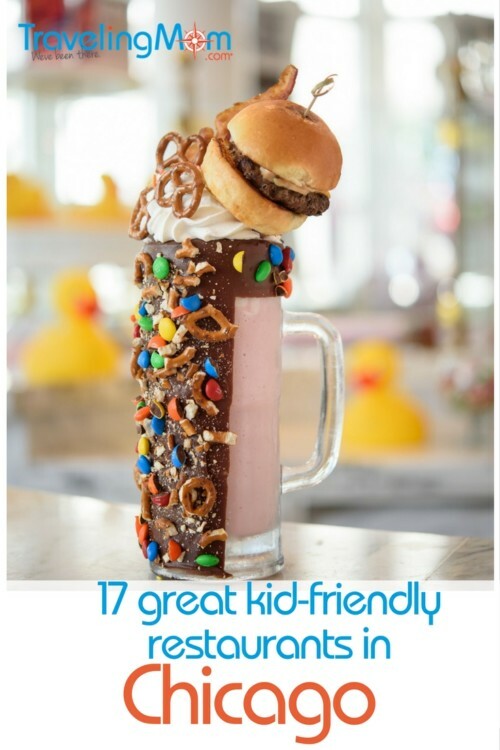 Families visiting Chicago frequently ask me, “What are good restaurants for kids?” So I’ve finally decided to compile a list of our favorite restaurants. Whether you’re looking for a $2.49 authentic Chicago hot dog or a $15.99 kids-sized filet mignon, here are some can’t-go-wrong options for kid-friendly restaurants in Chicago. While most Chicago restaurants have kids menus with things like a hamburger or grilled cheese, these restaurants go beyond that. If your kids will eat eel sushi or plantains, then you don’t need this list of kid-friendly restaurants in Chicago. You’ll be fine anywhere you go. This list is for kids like mine – picky eaters who need familiar food. For a restaurant to make this very prestigious list, it needs to have really good, kid-friendly dishes and a kid-welcoming atmosphere. Not just a menu with chicken nuggets. 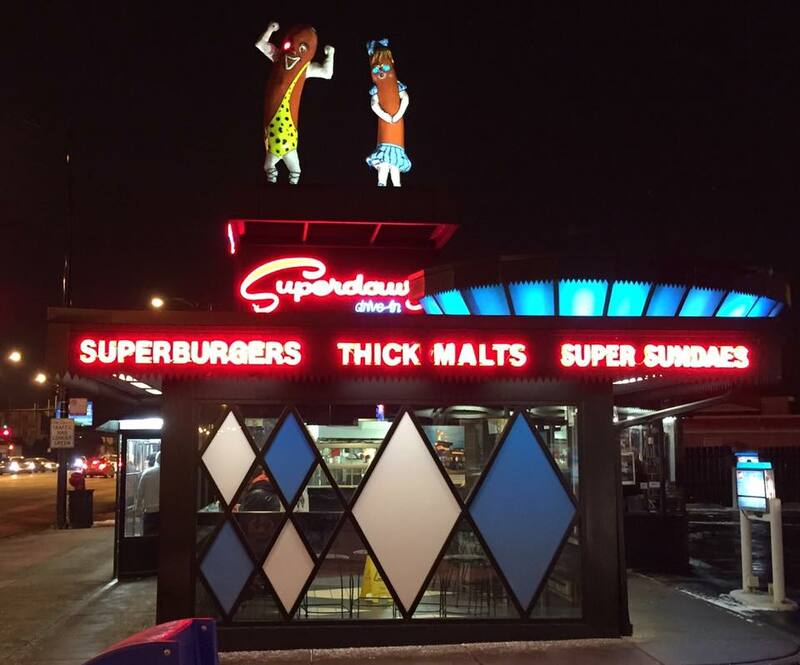 This Chicago institution has two, 12-foot-tall hot dogs, Morrie and Flaurie, standing on the roof. It’s a 50s drive-in, but who wants to eat in the car anymore? 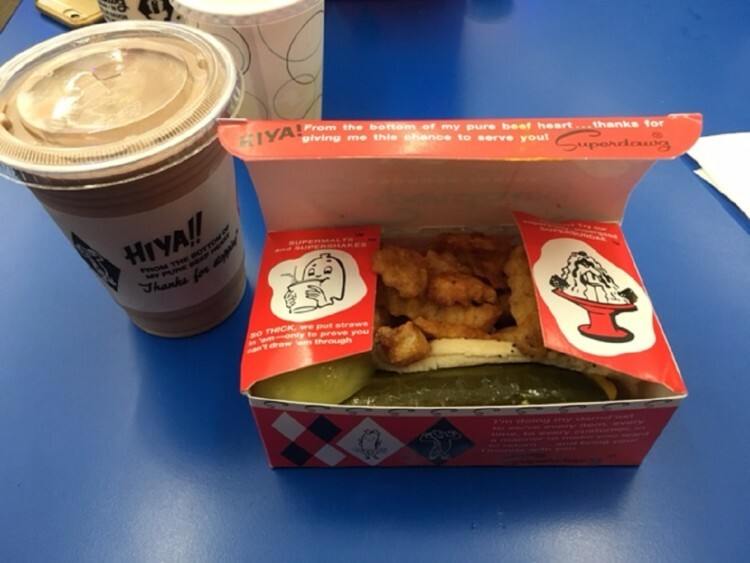 Go inside and sit at a table to enjoy your Superdawg (hot dog), served in a box stuffed with french fries and a pickle, bearing the restaurant’s trademark phrase, “Hiya!” Try their square-shaped Diced Cream Cones for dessert. Corner of Milwaukee and Devon Avenues, and also a location in north suburban Wheeling. TravelingMom Tip: When ordering, remember, they’re not hot dogs. They’re Superdawgs. Near Wrigley Field, this casual, comfortable neighborhood spot has delicious comfort food, especially rotisserie chicken. You HAVE to get the cornbread skillet, served with the hot maple butter. And for dessert, my kids love their cookie skillet. 3455 N. Southport Ave. For a list of other fun things to do in Wrigleyville with kids, see my story here. Awesome barbecue and baby back ribs are served in this corner tavern that’s been around since 1932 and is frequented by celebrities. I mean, wouldn’t the kids freak if a Chicago Cubs player or Jack Black walked into the restaurant? 1655 N. Sedgwick (in the Old Town neighborhood). Cinnamon roll pancakes? Fruity Pebbles pancakes? Or just straight-up fluffy, plain pancakes? All of the above at Wildberry Cafe, which has locations near Water Tower Place and Millennium Park. 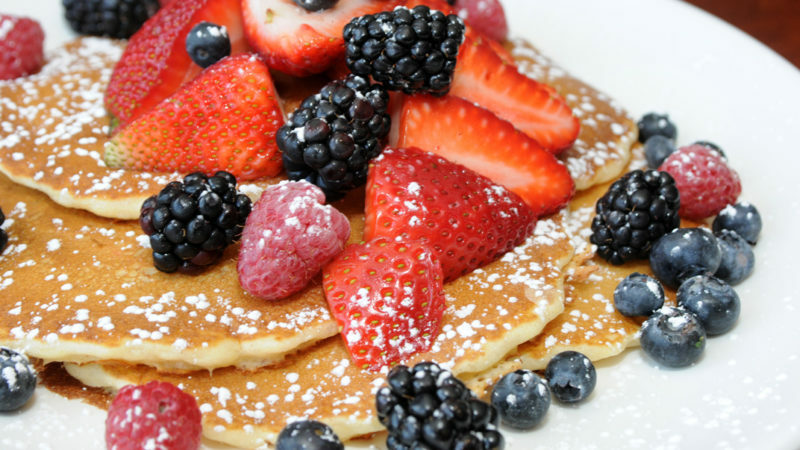 Another favorite pancake place is M Henry (5707 N. Clark St), an adorable Andersonville neighborhood spot with great, fresh food. Its fantastic kids’ menu has fun items, like a peanut butter, banana & honey sandwich. 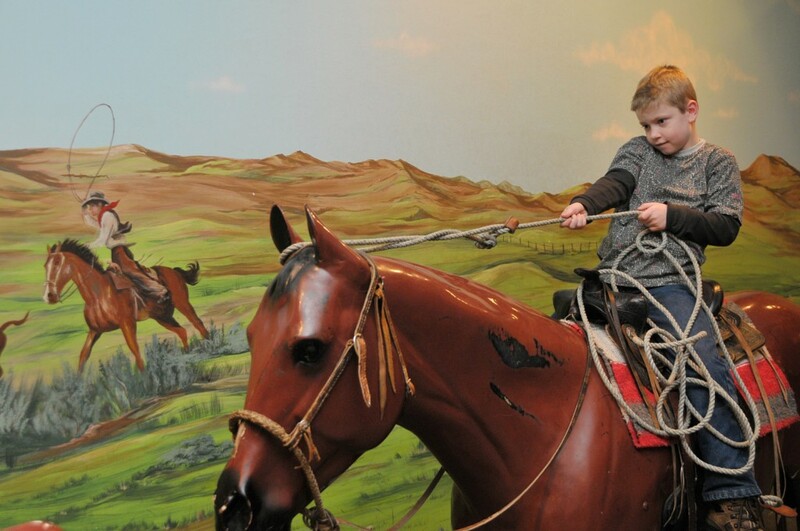 If you end up by Wildberry’s Water Tower Place location, check out my story on fun things to with kids around Water Tower Place. Across the street from Lincoln Park Zoo, my kids love reading this restaurant’s cartoon and joke-filled menu. Kids meals come with Wiki Stix. The menu consists of above-average bar food (burgers, wings, sandwiches) but they’re best known for their salad bar. We’re big fans of their milk shakes, too. 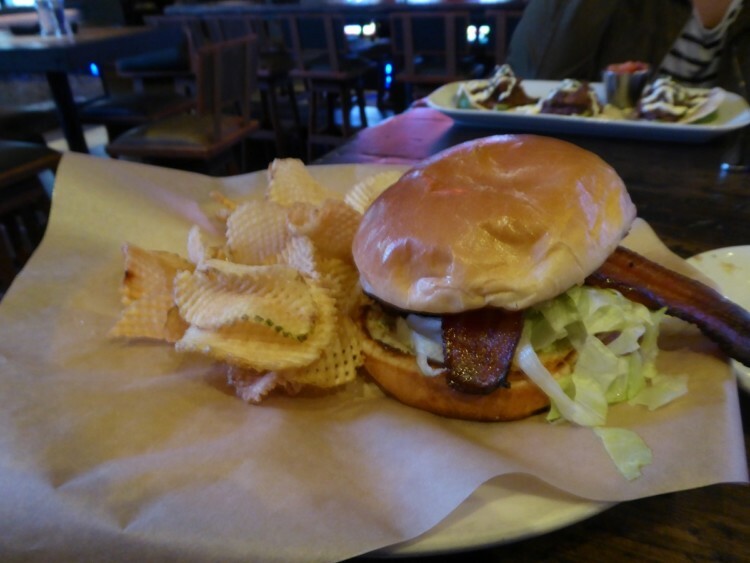 2056 N. Lincoln Park W.
Footlong slices of bacon are on the burgers at FTW. Photo by Jamie Bartosch/Suburban TravelingMom. These trendy, new food courts – made up of small, local restaurants – have something for everyone. Block 37, which is close to several theaters, is a mall with yummy options like Gayle’s Best Ever Grilled Cheese and Latinicity, the upscale Latin American food court. Revival Food Hall has everything from Furious Spoon (ramen noodles) to The Budlong Hot Chicken (a spicy fried chicken that’s trendy in Chicago now). Traveling through Ogilvie or Union Stations? Go to the basement and you’ll find the Chicago French Market, with 30 unique vendors. Some of the kids’ favorites: Made-onsite mini donuts from Beavers Coffee & Donuts, meatballs in a bowl of sauce from Polpetti’s, and the Montreal-styled pastrami sandwich at Fumare Meats. 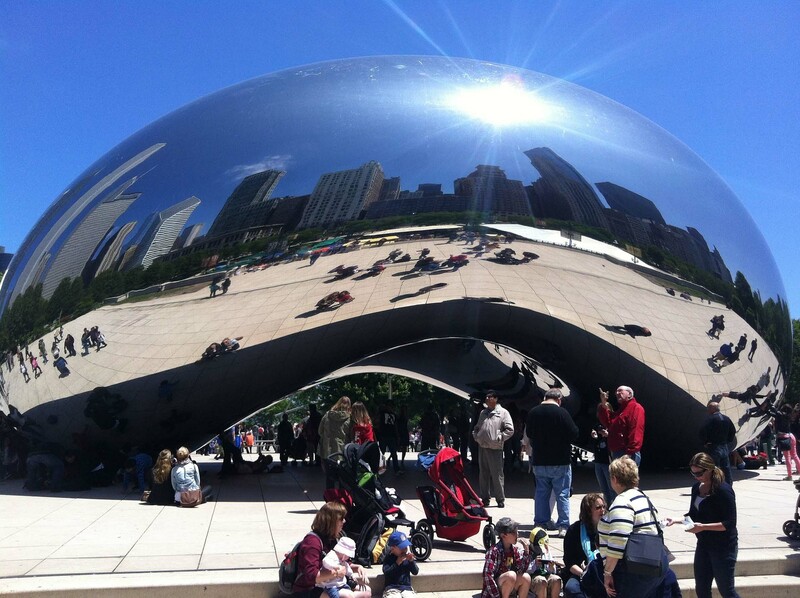 TravelingMom Tip: Do not go to these places between 11:30 a.m. and 1 p.m. on weekdays. They will be jammed with the work lunch crowd and it will be difficult to find seating. This is the place to go for a real Chicago hot dog or Italian beef sandwich. The beloved fast food chain, designed with 1950s decor, has locations all over Chicago and the suburbs. Save room for a slice of their awesome chocolate cake (or have it in a chocolate cake shake). Downtown locations at 100 W. Ontario and 520 W. Taylor Street. Parents might not love the prices, but tweens and teens absolutely LOVE this place for its over-the-top food presentations and colorful, splashy interior. 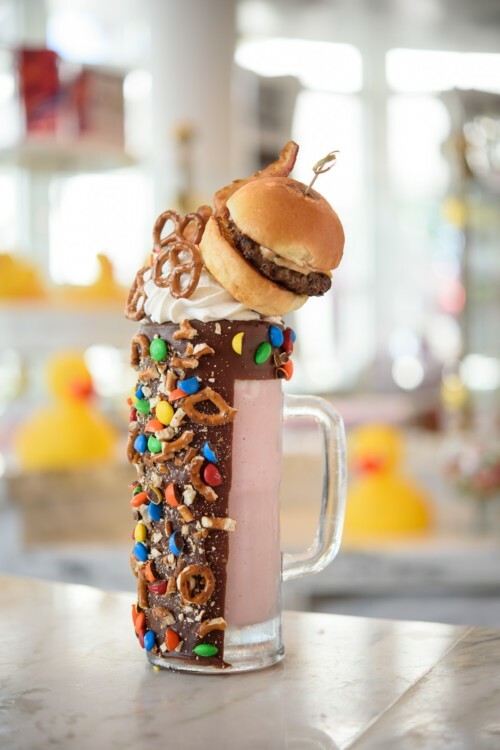 The smoke-filled punch drinks are served in fishbowl-sized glasses, and the menu is filled with fun items like a bacon cheeseburger milkshake (pictured above). The adjacent gift shops have celebrity-endorsed candies. 55 E. Grand Ave., or near O’Hare Airport (in suburban Rosemont). Chicagoans often debate who has the best deep dish pizza. My fave? Lou Malnati’s (or “Malnati’s” as locals call it). There are dozens of locations around the city and suburbs. TravelingMom Tip: It can take more than 30 minutes to cook, so if you’re pressed for time, order in advance. You’ll need to dress up for this fancy, Chicago tradition, which involves tiered trays of elegant finger sandwiches, English scones and desserts. They have kid-friendly dishes, like Nutella and jelly on white bread. But if your kid wants a cheeseburger, they’ll bring you a cheeseburger. 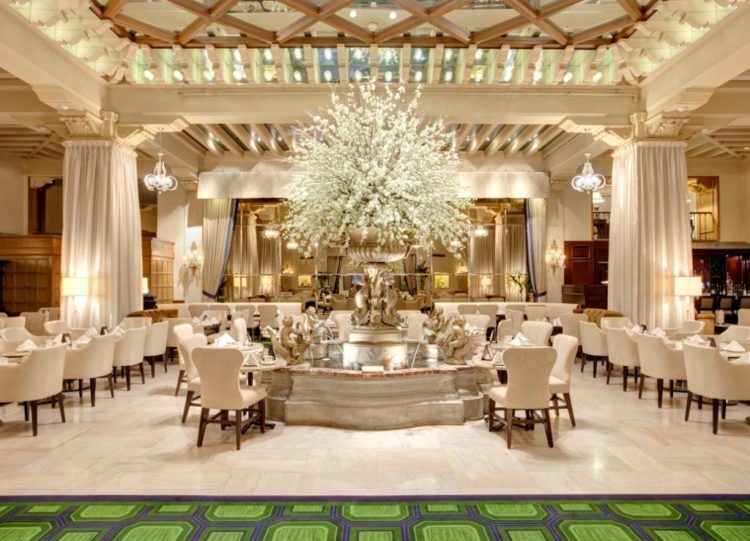 It’s a splurge ($20 per kid, $45 per adult), but to eat and sip tea in the historic Palm Court room while a harpist plays? It’s a memorable experience. Read about this and other afternoon teas in Chicago, here. 140 E. Walton Place. 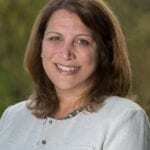 Jamie Bartosch is an award-winning journalist in suburban Chicago. Her stories have been published in USA TODAY, A&E, Midwest Living magazine, the Chicago Daily Herald and dozens of other publications. A married mother of two teenagers, she blogs for TravelingMom.com from the viewpoint of a "typical suburban mom." Her goal is to provide honest, useful information to help parents save time, save money, and make the most of their family vacation. Learn more about her at https://www.jamiebartosch.com/.